This week we welcomed Mark with his family and friends for their first trip to the venue. That’s not entirely true though as Mark fished Beausoleil once before some 15 years ago. 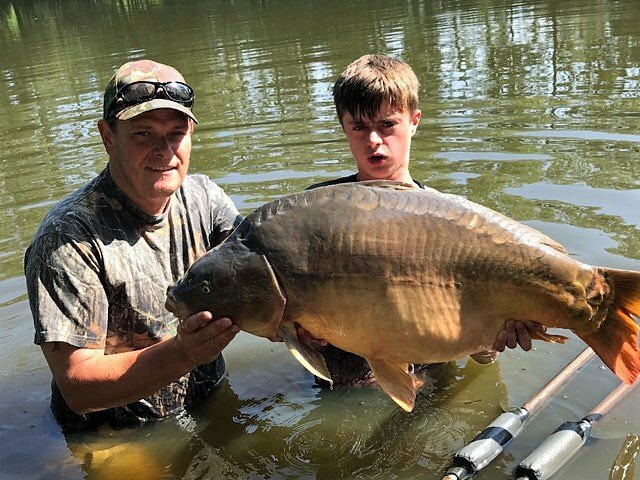 Based on the great memories he still had for the place, he decided it was the perfect place for Ian, Tania and their 16-year-old son to experience French carp fishing for the first time. The week started with a bang at the local bar, joining in the celebrations for France’s win in the World Cup and everyone got their faces painted! Last time Mark was here, Beausoleil was “a run a chuck” water with no bankside support and very few rules. The fishing was easy back then, the cats and the carp were much smaller and it didn’t really matter how you fished as catching was guaranteed…. Mark knew the water would be different now and had ordered Beausoleil bait and rigs for everyone to help them get going. Mark got a proper taste of how much the venue has changed when he got his rods out on Sunday morning. 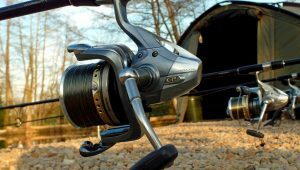 He was fishing tight lines and loose clutches on his 3 rods across to the island margin and had experienced nothing but liners…. Within minutes of slackening things right off and tightening the clutch, he was into his first carp! It’s always a pleasure to watch an angler play and land one of our fish and this carp fought really hard for a good 10 minutes! On the scales it came in at 28lbs. Mark was delighted to be off the mark and blown away by how hard our fish fight. The guys this week went to their local tackle shop to get the 25lb mainline as specified in our rules and bought what was available. When they got here, I’m afraid to say that I broke it with my bare fingers (no rig puller or glove required). Needless to say, no-one wanted to fish with it and they re-spooled with the Berkley Big Game that we had in stock. In the last 2 weeks, we’ve used 5 spools of our Big Game. This is still the only line that consistently does what it says on the tin. I’ve seen it multiple times and we did plenty of testing ourselves. It doesn’t matter which fashionable carp brand it is, even if it says 25lb or even 30lb on the label, it doesn’t mean anything until you’ve tested it by trying to lift an 18lb bucket of water. I know a lot of you want to support your local tackle shop, and I do too, but most of them don’t stock the Big Game unfortunately and you’ll have to get it online, we have a list of online shops you can get it from. No-one wants to see their line fail. 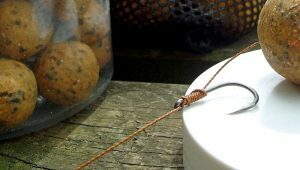 No-one wants to lose a fish or harm a fish so I feel the need to mention it again for the anglers coming to see us for the first time in the future. Thank you. 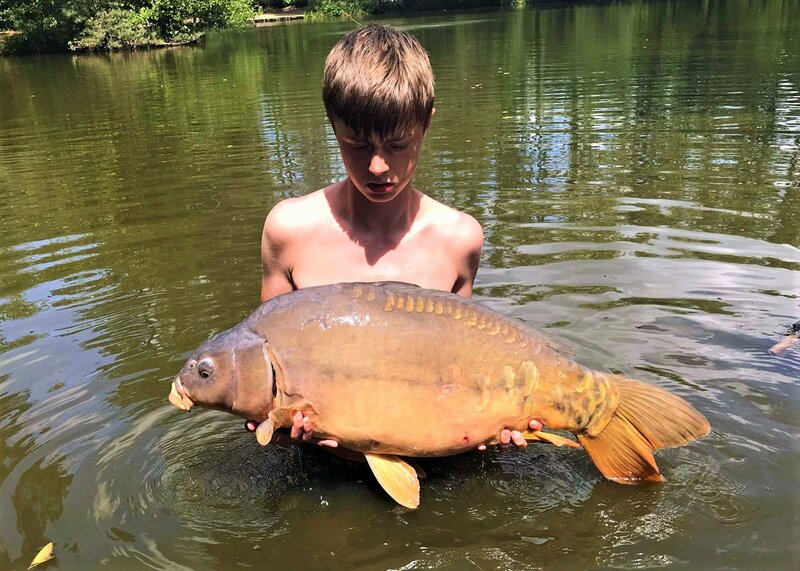 Beausoleil was a bit of a challenge for the first few days for everyone as it is such a different water to anything the guys had experienced before. 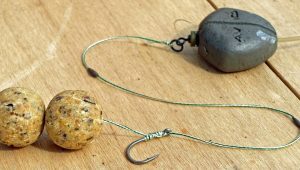 Once you can get to grips with the 3 golden rules: sharp hooks, slack lines and tight clutches, things can turn around very quickly though. 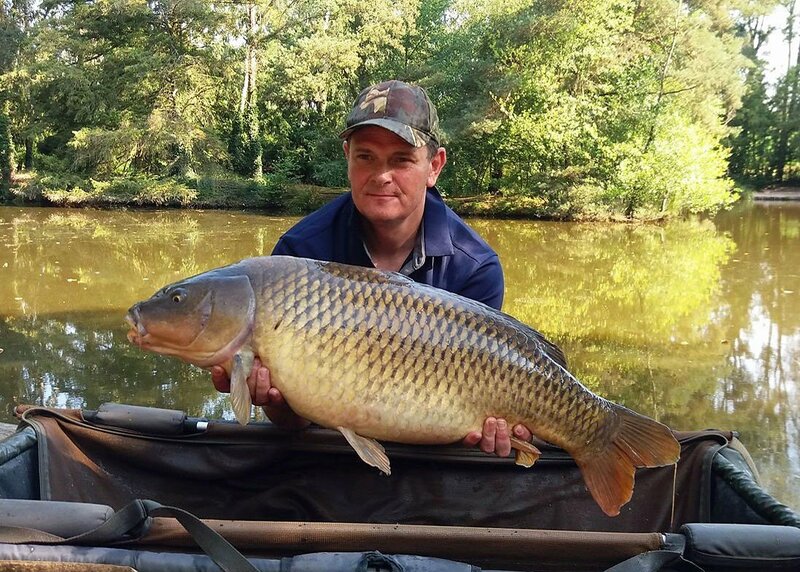 After tweaking his setup and catching the first carp of the session, Mark continued to catch throughout the week and even found a bit of time to enjoy some family time visiting the local attractions. 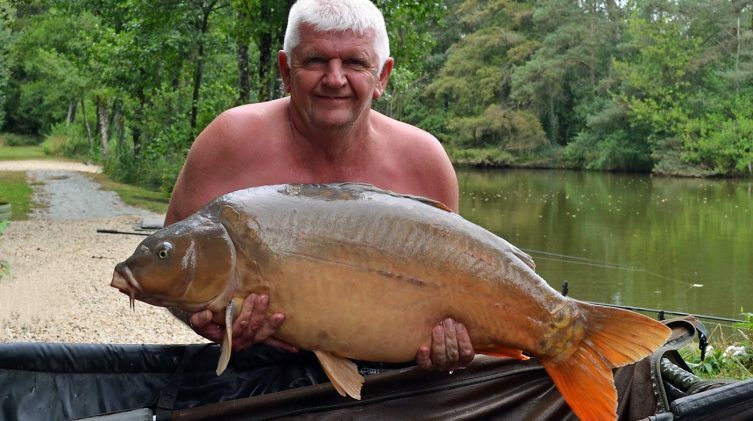 He really wanted Kane to get the full Beausoleil experience so when he hooked a big cat, he passed the rod to Kane who got to feel its incredible power but unfortunately, the cat won that time and pulled the hook. Mark finished in style on the Friday afternoon catching the lovely Janus. Ian who has plenty of carping experience but not much boat experience quickly got to grips with the rowing boat and the prodding stick. He found a lovely area of really firm margin off the edge of the island towards the bridge and this produced his first carp. At 40lbs it smashed his old PB by a mile, unfortunately everyone’s phones were dead! On one of my visits we saw a good carp bosh off the far bridge margin and it looked to be over a deep hole in the silt. Later that day Ian checked out the area and found the feature. 12 hours after salting the spot heavily with plenty of Beausoleil boilies and pellets it forced the mistake from a nice common. 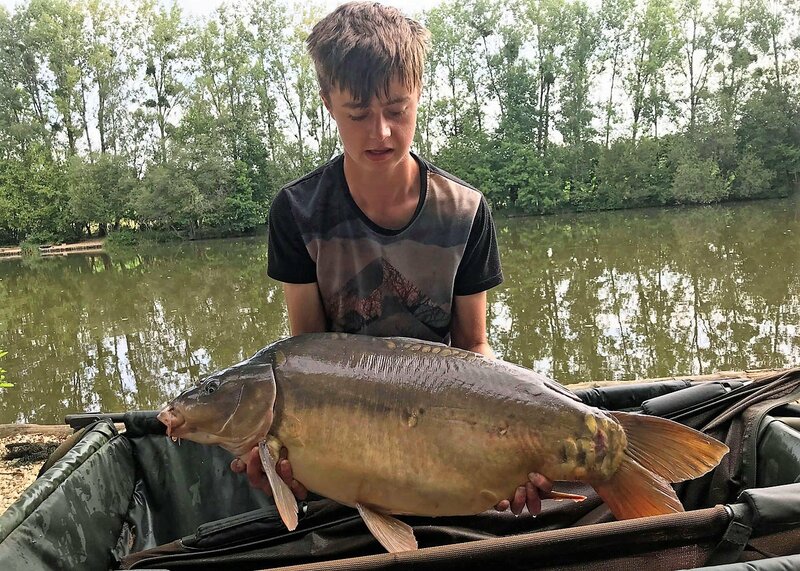 At 16, Kane may only have a few years of carping experience but he is an absolute sponge when it comes to knowledge and day by day, his skills and confidence grew as he started to see how the tweaks we made to his setup were producing results. After catching the sturgeon early on, he had to wait until Tuesday afternoon to finally get the run he was waiting for and bank his first carp at 30lbs. And then he got pretty serious! Kane had seen a decent carp show a few times underneath a tree on the snake bank and armed with the prodding stick climbed out onto the overhanging tree to explore the area properly. He found a nice fine gravel patch right under the knuckle of the branch he was standing on and knew this was the spot he needed to fish. The bait boat was loaded with a few kgs of goodies and he drove it precisely to the mark by walking round with the handset to get it inch perfect. That night he banked a Cut tail at 39lbs 12oz. Another new PB and he was absolutely buzzing! 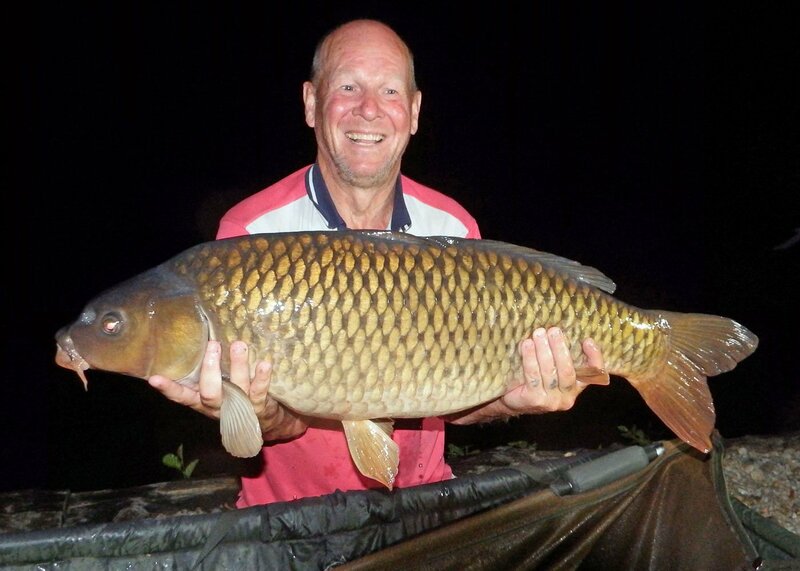 Kane ended up joint top rod with Mark with 6 fish for the week. Check out our July fish gallery. Kane’s mum Tania also joined in the fun and caught a perfect linear! This is one of our new small crop of Beausoleil babies and it’s the first time that we’d seen this particular fish. Not many folk get excited about a 5lbs 8oz carp but when they look like this and come from a water you care for, we were jumping for joy! Tania also banked the best cat of the week at 57lbs. 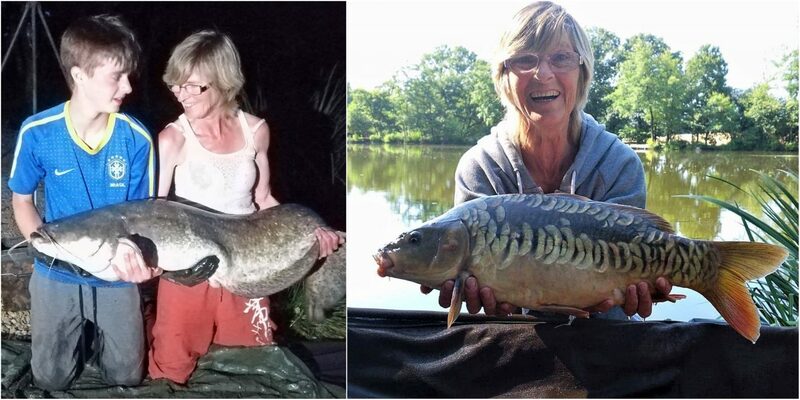 Fantastic work consider that three others were lost during the week and that her PB was a double figure carp! 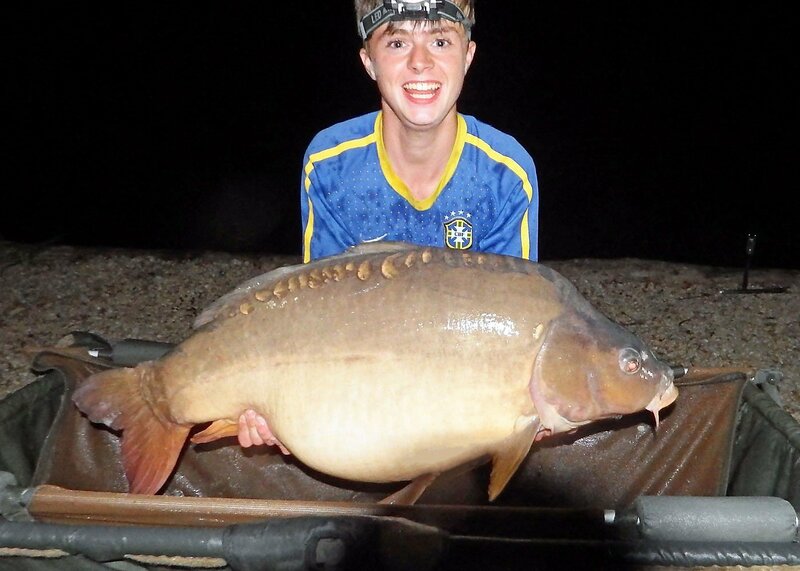 All the anglers did the nights but this week many fish came out during the day and Kane was only too happy to jump in the water each time, which is actually the safest place to photograph large carp, well done kid! 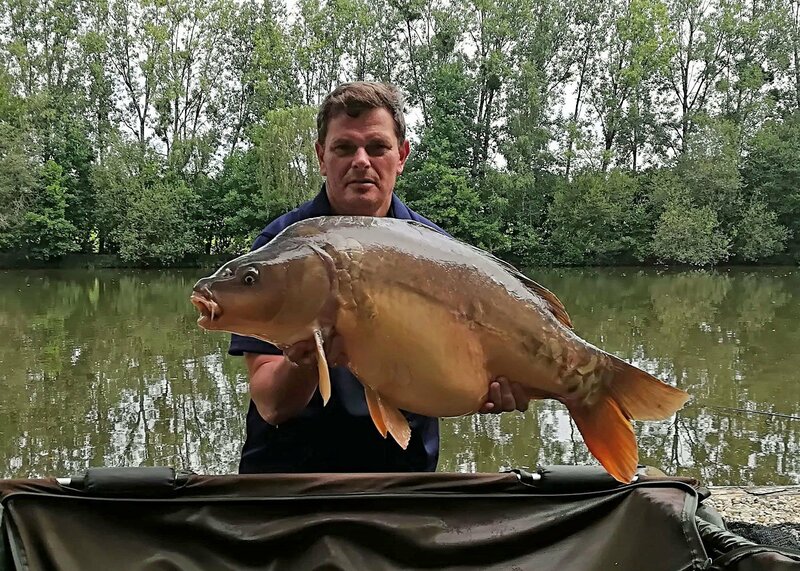 Despite all the information that’s available on our website on how to fish the lake and the support we offer our visitors before their trip, experiencing Beausoleil for the first time when you’ve never fished a similar lake before can be a bit overwhelming. So very well done to our all guests this week who were totally open to incorporate our suggestions to get results and memories that we hope stay with them for a long time. 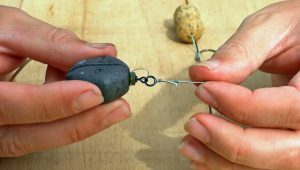 What did you find were the best swims/tactics/baits? 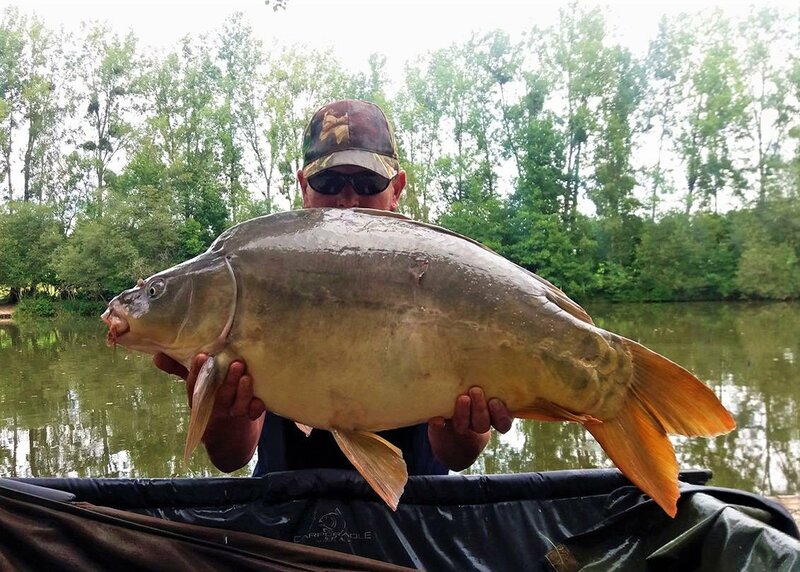 All good swims, Beausoleil baits. How did you find the accommodation? Accommodation is spot on, everything you need and more. What could we do to improve your holiday? Would you recommend our venue to a friend? On arrival, we were welcomed with a nice cold beer, everything was explained. Enjoyed every catch, relaxed with perfect views. Matt and Ren just a text away. Fantastic fish, superb experience.